When Apple released OS X Mavericks it made it clear that it was in no way rushing to make both its mobile and desktop operating systems uniform in terms of design. Regardless there are always ways to customize your Mac yourself if you would like it to resemble the design style of iOS 7. This includes using things like icon packs, wallpapers and other utilities. Now, however, there is an easy way to bring the great looking lockscreen from iOS 7 over to the Mac. All it is, is a screensaver with an oversized, 4-digit clock, an animated background and the text “Press any key to unlock.” Best of all it’s easy to install and customizable as well. 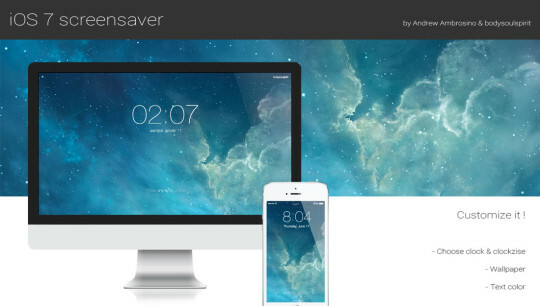 According to the developer this screensaver supports OS X 10.8 Mountain Lion and below, and OS X Mavericks. It’s worth noting, however, some MacBook users with Mavericks installed have reported issues getting it to work. With that said here’s how you configure the screensaver. Step 1) – Download the screensaver from the developer’s website, and open the package. Step 3) – Lastly go inside your Mac’s system preferences and click the Desktop & Screen Saver icon. The new screensaver should show up towards the bottom of the list. You can now apply the screensaver and of course it by opening the screensaver options. What do you guys think of this screensaver? Did it work for you? Let us know in the comments section below. Because some people like this. i thank u mean MacBookPro?